Well, I must say I am high as a kite today. Last night we were out celebrating Julia's (my fiancee) birthday at Fox & Hound in Quincy. When all of the sudden two tables over a guy jumps up knocks a table and starts screaming help, help, help! Some how I immediately knew exactly what was going on and what to do. I jumped up and ran to the woman in the chair, who was choking, pulled her out of the chair and stood her up from behind. I then gave her two quick heave hoes to the stomach and the glob of food came spitting out. Who knew the lobster macaroni could be so dangerous. I want to give big thank you to Delta Airlines who taught my mom the Heimlich maneuver as flight attendant... who in turn taught me. The whole thing was like straight out of a movie. All the people were screaming and yelling for 911 and it was pretty intense. I was really calm until I sat back down to sign bill and I started shaking so much that it was hard to do my signature. I guess the adrenaline was going away. The best part was when Julia and I reached the car she told me that as we were leaving the guy leaned in and said, "you better marry that guy, he's a keeper." I'm just happy everything worked out. I've heard of people choking to death in restaurants while everyone stood around frozen. I've also heard of people breaking people's ribs while trying to do the Heimlich maneuver. So thank God everything turned out great. Either way this is one birthday we will never forget. Here is some info on the how to do the Heimlich maneuver. Learn it! You could save someone's life. p.s. 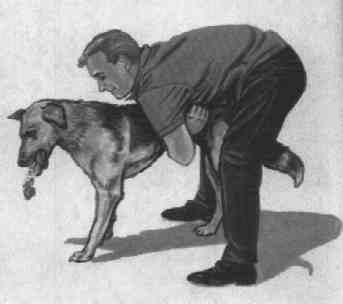 Did you know there is the Heimlich for your dog too?